KISSIMMEE -- Sweet-faced children warbled carols. The community center was ablaze with red 10-foot towers of potted poinsettias. Yet all resident Merrie Morrissey heard was the sound of her retirement village's landlords asking for more cash. There's a requested $14,140 donation for new carpeting in Good Samaritan Village Mobile Home Park's community center; $15,645 to resurface the pool; $120,870 to buy seats for a newly constructed amphitheater they paid for themselves. 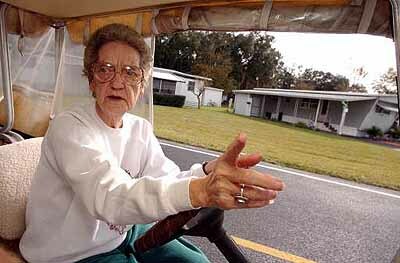 dwindling bus and health services and other problems have made her and 140 of her neighbors mad enough to sue. So they did. "We're a rent payment to them. No more and no less," groused Morrisey, 68, a lean retired nursing assistant. Lot rent increased $60 a month in three years, Morrissey and other fixed-income residents said. Complaints of chronic flooding, dwindling bus and health services and other problems have made her and 140 of her neighbors mad enough to sue. So they did. Mary Kraus, executive director of the retirement community, said the plaintiff's lawyer is just after money, and the suit will only hurt the neighborhood. "We're a nonprofit agency," said Kraus, who would not respond to the accusations in detail, saying her office has not been officially served. "The only money they will get is from other residents." On sunny Wonderland Way, sprightly retirees in bright winter coats exchanged waves as they zipped between mobile homes on electric golf carts. As her own cart slowed to a weak sputter, Morrissey showed off the neighborhood of 445 mobile home lots that she used to love. "The only reason I stay here is because of the neighbors," said Morrissey, a 13-year resident. "It's the only reason anybody stays." The village is billed as the largest retirement facility of the 81-year-old Evangelical Lutheran Good Samaritan Society, a Sioux Falls, S.D., nonprofit organization with $1.6 billion in income, according to a 2002 tax filing. The Kissimmee village used to provide services aging residents needed to feel safe and keep healthy at little or no cost, residents said. Free nurses were on call 24 hours a day. A security patrol gave jump-starts and helped people locked out of their homes, also at no cost. Buses took residents to buy groceries and to the doctor's, while crutches and canes were lent for free. A community-wide cable channel kept everyone in touch with village life, which hummed with bingo games and free parties at the common room. Now ,residents complain, there is a fee for the jump-start, and for nurses who are no longer available 24 hours. There is also a fee for the common room, and the village no longer covers a $50 deductible on ambulance service. Lots have flooded, causing mold and other problems. Apartments sit empty, some in the process of demolition. Residents involved in the lawsuits say they are victims of unfair rent increases and business dealings and poor maintenance. "This is no longer about a community. It's about money," said resident Carole Fink, a former sign-shop owner from Miami. Morrissey said that because of the problems, she resorted to carrying a camera in her golf cart to chronicle park conditions: ankle-deep flooding on Scotland Road and trash containers overflowing with garbage. Past a screen door adorned with a plastic Santa head that shouts "Ho Ho Ho," residents gathered in Fink's double-wide to tell stories of what they view as the park's decline. Inez Steinwachs, 80, a retired engineer, said she relied on the nursing service when her husband fell ill when he was still living at home. Then management started charging $25 a visit. It was expensive, but she paid. "My husband is 6 feet 8 inches tall. I couldn't get him off the floor if he fell," Steinwachs said. "It was a lot of money." Some struggle to get to the store, medical appointments, the library or church now that bus service has been reduced. The park started charging shut-ins $3 to have groceries delivered and then eliminated the service entirely. It's $5 each way, Morrissey said, to go to the mall. Albert Mattson, 71, a resident and former volunteer bus driver, worries about his former riders. When residents were too frail to carry grocery bags, he put them in their refrigerators himself. "You'd open the refrigerator and there'd be nothing in it," the former electronics worker said. "They could barely afford bread and milk. How could they pay to have groceries delivered? Or higher lot rent?" "They stop paying for their prescription drugs," Fink replied, and leafed through a copy of the complaint.